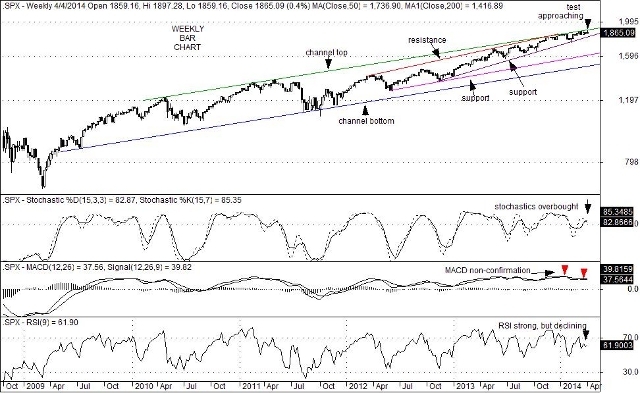 Is The S&P 500 Index Ready To Begin A Correction? With earnings season about to begin, the technical set-up for the S&P 500 Index (SPX) suggests that correction is entirely likely. The problem is that many investors appear to be expecting that event to occur, which might be just the reason that lessens such an outcome. Nevertheless, weekly stochastic oscillators are in an overbought condition with weekly MACD studies (Moving Average Convergence/Divergence) diverging bearishly. Moreover, key channel-top resistance sits just above at the 1,905 level. Another interesting point to remember is that the guidance of many firms has been lowered for Q1 due largely to weather related issues that in truth have acted as a drag on many segments of economic activity. 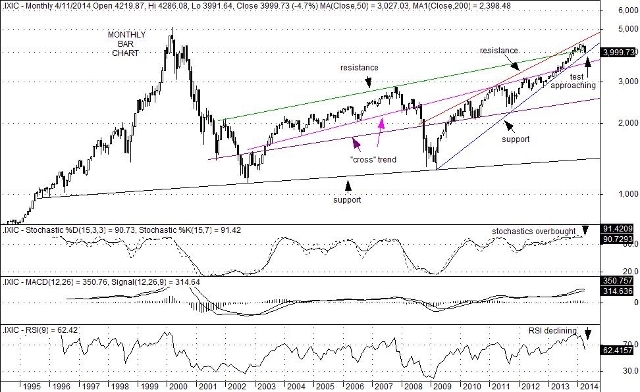 Further, a rolling rotation out of momentum stocks and into defensive sectors has trimmed some of the speculation that was very visible to most investors. Another wrinkle to consider was that comments made by Fed Chair Janet Yellen in March appeared to reflect a much more dovish stance than was expressed by her earlier in February. As a result, the expectation for any meaningful rise in interest rates may have been pushed to the much renowned back-burner. What are investors to do? Corrections are necessary in order to dissipate some of the froth that accompanies excessive bullishness. That being said, it might well turn out that the rolling rotational out of high beta stocks and into defensive positions might well be acting as a proxy for a full fledged pullback. Of course Q1 earnings, as well as a set of fresh guidance parameters will likely be greeted with great interest by investors just as the month of May approaches. What is that old saying? Sell in May and go away? Perhaps, if key trend line support currently sitting at the 1,800 level gives way to increased selling activity.